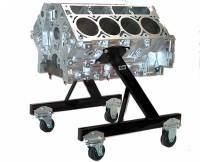 This is a light weight and compact engine stand. You can even leave the transmission attached. The stand is constructed of 1" x 2" x 14 gauge tubing. The mounting plate is 1/4" steel. It features 9 -1/4" of clearance w/o casters to fit deep oil pans. Mounting bolts are included. 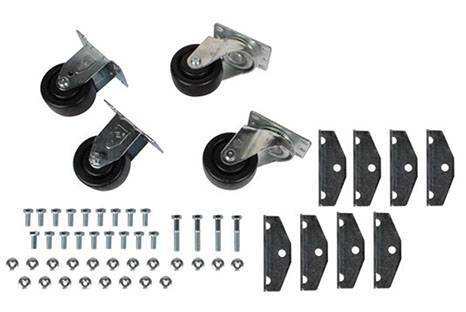 Casters are 3" x 1 1/4" inch wide making it easier to roll and move. Each caster rated at 300lbs. Note: The engine storage stand will NOT clear the "batwings" of a C5 Corvette oil pan when it is bolted to an LS engine.